How to Avoid Slip & Fall Accidents in the Winter | Wayne G. Resmini | Resmini Law, LLC. While slip and fall accidents can occur at any point during the year, the winter months definitely see the highest volume of cases. Snow, ice, and less daylight can cause sidewalks and crosswalks to become extremely dangerous. First and foremost, look where you are going. Refrain from looking at your phone, watch, or any other distractions as much as possible. Paying attention to where you are going can help you spot that patch of ice or obstacle that could potentially cause an accident. As a general rule, it is wise to slow down when walking around in the wintertime. 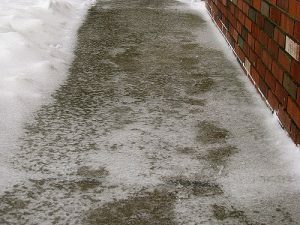 Just as with car accidents, reducing your speed on icy surfaces can drastically reduce your chances of a slip and fall. Even if you are in a rush, it is best to walk slowly than to risk injuring yourself. Make sure your winter boots and footwear have sufficient traction to prevent you from slipping on untreated surfaces. If your boots are worn out, consider buying a new pair that can endure slippery sidewalks and crosswalks. Poorly lit sidewalks and parking lots are a recipe for disaster. You can’t always count on there being sufficient lighting where you walk, so it is a good idea to bring a flashlight with you to see where you are going. Avoid walking around during a blizzard or winter storm unless you absolutely have to. Poor visibility and rapid accumulations of snow and sleet can greatly increase your chances of a slip and fall accident.